We went to one day of this third Test of the 2005 Ashes series. We went the day it rained. At the time, we lived a couple of stops away on the tram, so we just waited at home until we knew when play was due to start and then headed out. We will never forget what it was like when we arrived. Play only started at 3pm, but because this series was shaping up well, every single spectator had turned up at 10.30am and waited patiently. We say ‘patiently’ but perhaps ‘thirstily’ would be more accurate. It was abundantly clear that everyone was leathered. People were playing impromptu games of cricket in front of the beer tent even though there were puddles everywhere and hardly anyone could stand up. When the players did come out, it was a weird atmosphere where everyone was ferociously committed to appreciating every minute, largely through shouting at Jason Gillespie. It was a good job they enjoyed abusing poor Dizzy, because the cricket itself was mostly just Shane Warne scything fours into the offside. As soon as they’d played enough that we couldn’t get a full refund, the players went off again, even though the weather hadn’t deteriorated one bit. 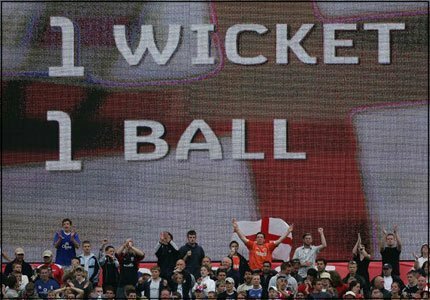 The magnificent final day began with thousands of people locked out of Old Trafford and ended with England needing one wicket off the final ball. They didn’t get that wicket and Australia rejoiced. “Look at them celebrating a draw,” said Michael Vaughan. I thought we’d blown it after we drew this test………ever the pessimist. i watched the highlights of the last day of this in a sports bar in edinburgh. i was with a friend and we were nail-biting and jumping up and down all the way through. when it ended he confessed that he already knew it had been a draw and he was pretending for me. it was the nicest thing anyone has ever done for anyone ever. As this match finished on a Monday I was in theatre, with me anaesthetising for my friend Jane (a surgeon). We were lucky that we were in the one theatre where the Radio 4 reception was ok.
Daisy and I had booked a day’s leave on that Monday (as we are wont to do for Day 5s). We did some comparatively forgettable things earlier in the day, in between picking up the radio commentary, and then hunkered down to watch the last 40 overs or so of the match. Daisy is more optimistic than me and was convinced that England were on top in the series and would stay on top. “You don’t understand”, I said, “we have to win to get the Ashes, a drawn series is no good to us. That was our chance and we’ve blown it”. Oh Jo, if only you had been doing a vasectomy. i feel that i should point out at this point, i had a spare ticket for the day after the day it rained, i politely offered it to king cricket… who informed me at about 9am that he was far too hung over to attend… i sold the ticket at face value, i later found out that i could have got something close to 5 times that amount for it.. it was however a good day, except my mate stan was a bit ’round shy’. i think we went for a curry afterwards, and then missed the last train home.